Honest Outfitters tackles everything from pet car seats to plant containers and camping gear, and they always do their best to deliver quality products. This article will focus on just one of the amazing products that Honest Outfitters makes for camping enthusiasts around the world: their 3-4 season sleeping bag for adults that is a well-rounded product and a step-up in comfort from their quilted dog car seat covers. 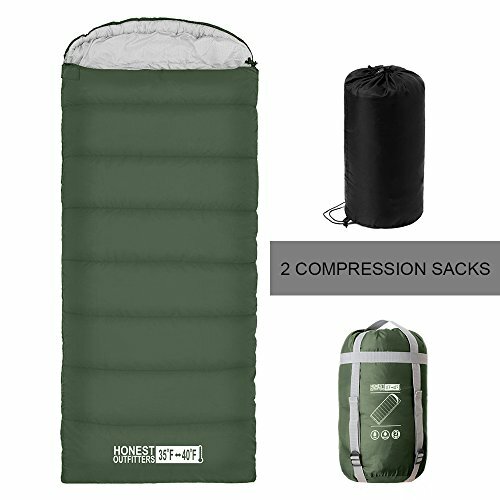 The sleeping bag offered by Honest Outfitters is not your typical sleeping bag. Not only the bag is very comfortable, but also it caters to a wider consumer base. The 3-4 season use, however, is probably not as impressive as the interior space or the exterior proofing, but we’ll let you decide that for yourself. Who would be interested in a 3-4 season quality sleeping bag? Obviously, avid campers who hit the outdoors at every opportunity will appreciate the Honest Outfitters sleeping bag the most. This could also be a solid purchase for people who don’t necessarily like sleeping outside. Why? Think about those adventurous friends you have that are always a pain to shop. They’re never in the same place more than a few days at a time, and it’s hard to get them a reminder gift that they could take with them. Nothing says you care more than a comfortable Honest Outfitters sleeping bag accompanied by safe travel wishes. You can use both compression sacks to store the sleeping bag and protect against tears, or you can use one for the bag and the other one for additional tools and gear you need on your trip. While this sleeping bag is not designed for use under a cloudy sky, its waterproof 210T polyester is excellent against accidental spills or under a leaky tent, although it could very well handle light summer rains if you’re caught in one with nothing but your sleeping bag close by. The mummy-style hood can be adjusted to be as relaxing or as tight and warming as you like by pulling on its drawstrings. Also, don’t let the lightweight design fool you. While it only weighs around 3.2lbs the Honest Outfitters sleeping bag provides a lot of comforts even for temperatures between 35° and 40°. The bag itself is 87” long and 29.5” wide which suffice to say is more than enough, even for some professional basketball players. The width may feel a bit tight at times, but it should be comfortable and warm as long as you don’t tend to move too much in your sleep. The Honest Outfitters sleeping bag can be zipped up close with ease from both the outside and inside. To keep things simple, the drawstrings for the hood, however, should be adjusted before you zip up the bag. When it’s time to wash the bag, the process is hands-free. You can fold it up and put it in your washing machine; make sure you use the recommended settings printed on the bag’s label. Of course, not everyone will find everything they need in the Honest Outfitters sleeping bag. For some, nothing is ever enough, but for others, the specifications might make the difference. For instance, if you simply must have extra width and more room to move your arms around, you could try Redcamp Outdoor sleeping bag or the Coleman White Water adult sleeping bag. Both alternatives offer more width, and you can even put two Redcamp sleeping bags together to make an extra-large sleeping bag with added warmth and room for a guest. However, these sleeping bags don’t come in the same length as the Honest Outfitters sleeping bag nor do they have waterproofing. In the end, it will come down to your particular needs before you make your choice. Whether you want to send it as a gift or you want it for yourself, the Honest Outfitters sleeping bag has all the makings of a good 3-4 season sleeping bag. The waterproofing is a very nice feature to have, as is the massive length that lets you fully stretch before you shut your eyes.The price tag is very attractive bearing in mind how much material you’re getting for it. Considering it’s quite easy to use and even easier to maintain (washer/dryer friendly), investing in Honest Outfitters sleeping bag is a good idea for most everybody, especially if you worry about having enough leg room or occasional spills of coffee.